July 17th harvest. 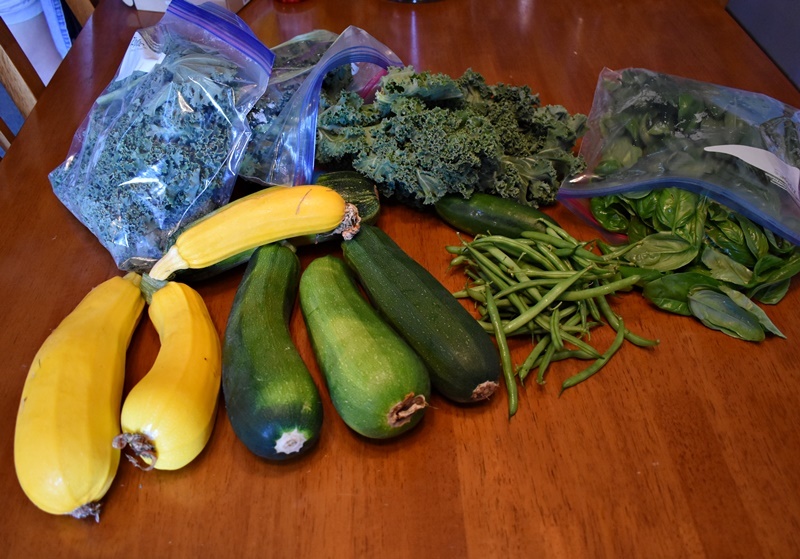 Kale, basil, green beans, zucchini and yellow squash. Here it is August already. I’ve had a decent harvest so far but maybe not quite as much as I had hoped. With two zucchini plants and three yellow squash I really thought I’d have a bit more. Maybe it was the heat, maybe it was the irregular watering, or maybe it was the crowded conditions but there would be beautiful squash flowers and then they would either fall off or the fruit would grow a bit and then dry up and I’d have to pick it off. 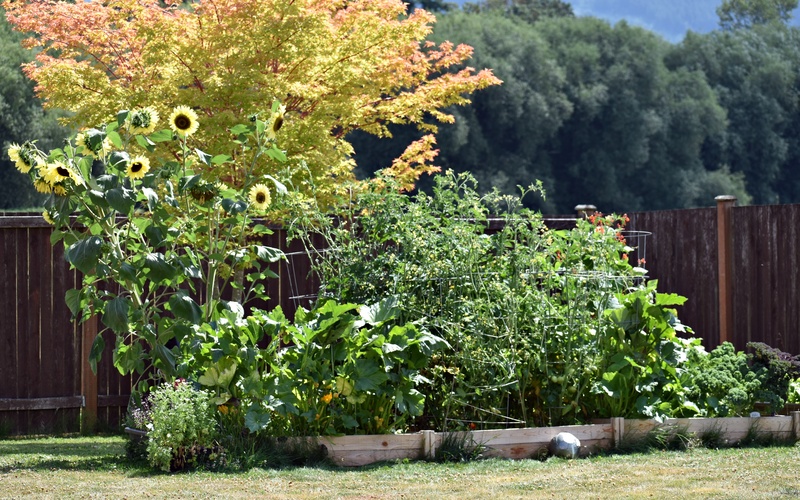 Next year I really need to think about a drip watering system that will supply the garden with a more regular watering. We’ve been watering by hand and so I don’t think it was getting watered evenly. Maybe a little too much one day and not enough another? Well we figured from the beginning this year would be our practice year. It still did a whole lot better than we thought it would and are pleased with the results. August 8th harvest. More green beans, zucchini and yellow squash. The tomatoes are turning red finally and we have cucumbers. I finally bit the bullet and pulled the kale. I couldn’t keep up with it even giving it away to people. It was also getting infested with aphids. So many that I just couldn’t wash them off anymore. I had hoped to blanch a bunch of kale and then freeze it but that never happened. I also lost my biggest sunflower plant. It had been growing at an angle and even with all of the bolstering I tried doing it finally gave up the ghost and snapped off at the base. It had some huge sunflowers on it and I was sad to come out in the morning and see it lying there on the ground. August 18th – it’s starting to look a little sad isn’t it? We have had an incredibly hot and dry summer and my yard and garden are showing it. Daily watering of the garden is keeping it alive but you can see that most of the plants have given up what they can and are slowing down. 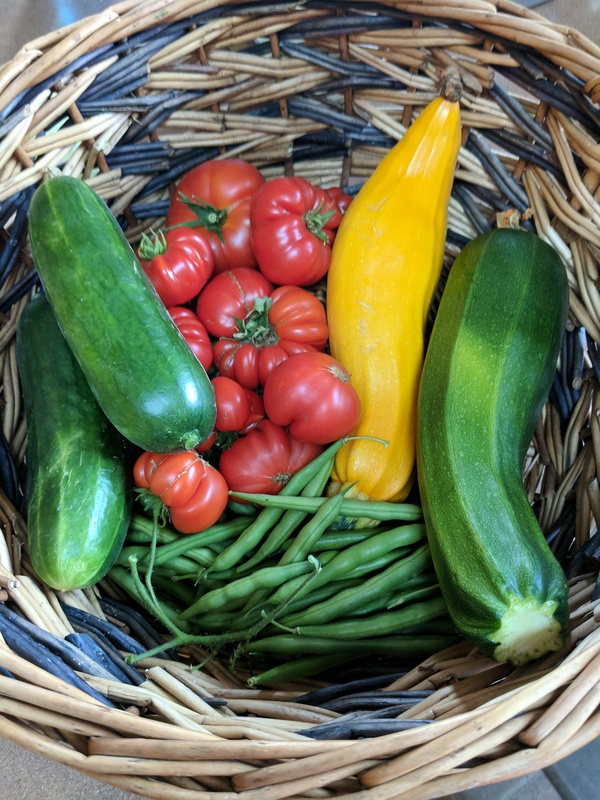 Today I pulled a zucchini and yellow squash out because they weren’t producing anything, just blooming and small veggies that would rot and fall off. I also pulled out the beans. They were getting tough and overgrown as well. 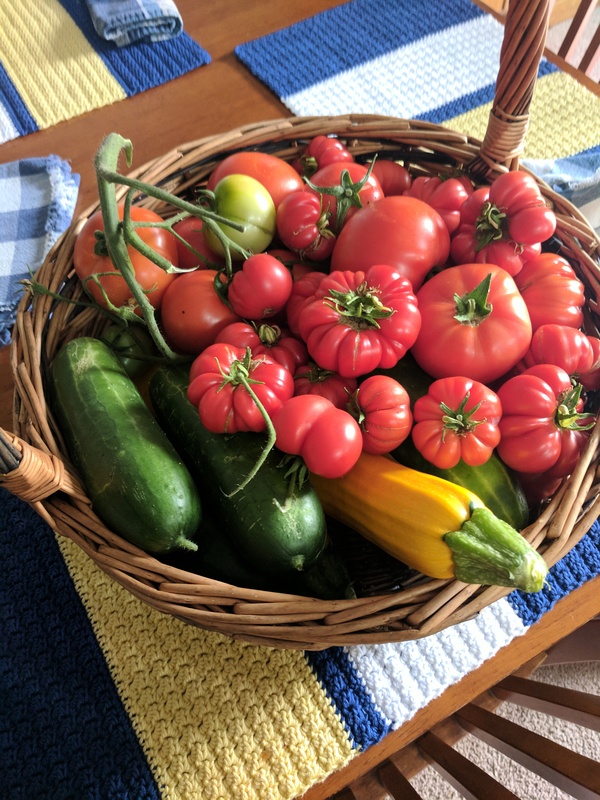 August 18th harvest – tons of tomatoes. You can’t see the cherry tomatoes hidden under everything. Cucumbers, yellow squash and zucchini there too. The harvest this morning was amazing. My cucumber is still producing which is surprising after it seemed like it wasn’t going to make it. It had a rough start. Within the next day or two I should have four or five more ready for harvest and still plenty of the little gherkins forming. 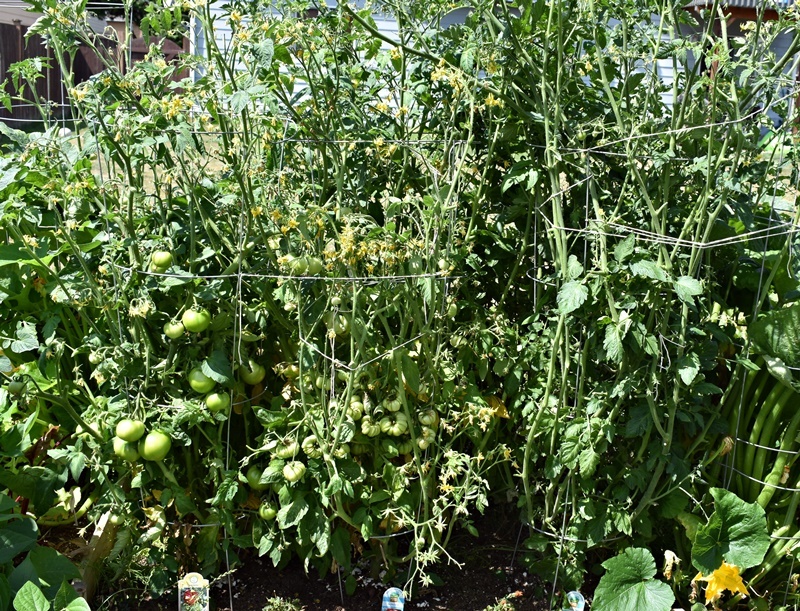 Still have a ton of green tomatoes and at some point they are probably all going to turn red at the same time. The branches are getting pretty dry and I end up getting green tomatoes with the red because the whole branch just falls when I try to grab a tomato. I guess I could try fried green tomatoes for the first time huh? This is after we pruned. It’s a jungle out there. 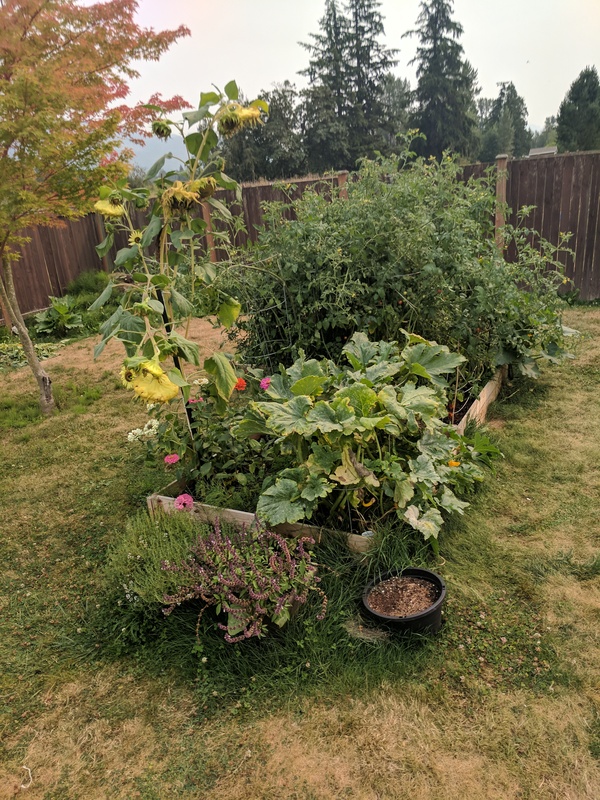 We are really enjoying our first gardening adventure and have been making lots of notes and plan on doing better next year. Especially spacing and pruning early! Keeping notes is so important. I refer back to previous year notes a lot. I bought 3 garden journals that contain 3 year’s notes in each. 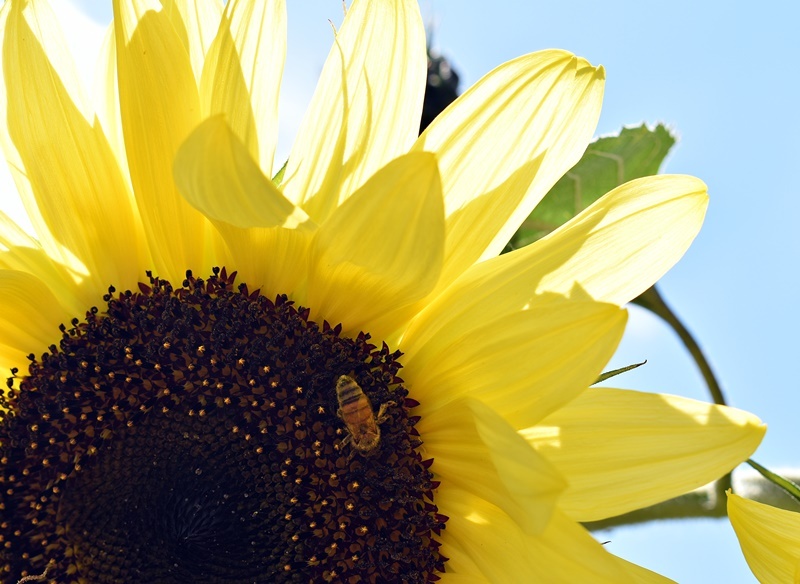 Congratulations on such a successful garden year! Thank you! I found that writing notes down has been helping a lot as does a lot of research. As I write down notes I do some research and save links or jot down even more notes. Hopefully this initial effort this year will mean a better garden next year. A really good initial effort, and it seems you’ve learned a lot. Kudos! Thank you! I was pleasantly surprised at how it took off. I’m hoping my notes will just improve it next year.